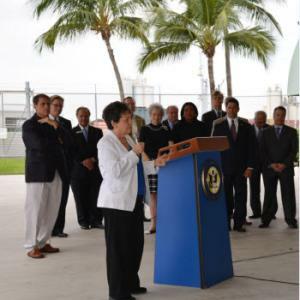 On June 28, 2013, the U.S. Army Corps of Engineers released its draft report for deepening and widening Port Everglades&apos; navigational channels to enable safe passage of deep draft post-Panamax cargo ships. According to the report, the total project will deepen Port Everglades&apos; channel from 42 feet to 48 feet (when constructed, the project will include an additional two feet of allowable overdepth for a total of 50 feet), and widen the channel entrance so that cargo ships can safely pass cruise ships docked along the Intracoastal Waterway inside the Port. The total cost for deepening and widening Port Everglades&apos; navigational channels is estimated at $313 million, which will be paid for through a combination of federal funds, port user fees and possibly state funds. No local tax dollars will be used for this project.